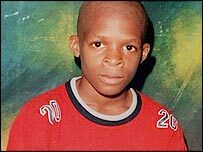 Three teenagers have appeared in court charged with the murder of schoolboy Damilola Taylor in November 2000. Hassan Jihad, 19, and two brothers, aged 16 and 17, all from Peckham in south-east London, were charged on Thursday with the 10-year-old's murder. 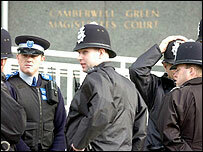 They were remanded in custody until 14 January after appearing at Camberwell Green Magistrates' Court on Friday. Damilola bled to death after being stabbed in the thigh with a broken bottle on his way home from school. Police have confirmed the group had previously been arrested over the killing but were not charged at the time. Detectives said all three were unemployed and would have been aged between 12 and 14 at the time of Damilola's death. In 2002, four youths stood trial for the killing but were cleared. The case was kept open and detectives have been using new DNA techniques to gather fresh evidence. In September, police searched several addresses in Peckham. Damilola's parents, Richard and Gloria, were told of Wednesday's arrests in advance. In a statement after the arrests were made, Mr Taylor said: "All that we have ever wanted is justice for our son." Damilola died in the stairwell of the North Peckham Estate after being stabbed. At the Old Bailey trial, evidence from the prosecution's key witness, a 14-year-old girl, was ruled inadmissible by the judge who ruled it was unreliable. Two youths were then acquitted on the direction of the judge and another two were found not guilty. The three defendants, who spoke only when they were asked to give their dates of birth, will next appear at the Old Bailey.